An unaltered photocopy of your DD-214, WD AGO, NAVPERS, NG or other military issued document clearly displaying your award of the USAF Recognition Ribbon. The Air Force Recognition Ribbon was established on October 12, 1980, by the Air Force Chief of Staff, General Lew Allen, Jr. 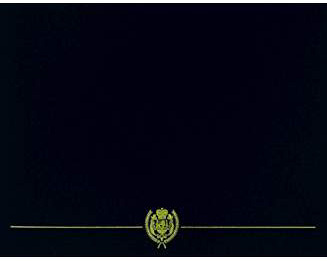 The Air Force Recognition Ribbon has been in effect since October 12, 1980. 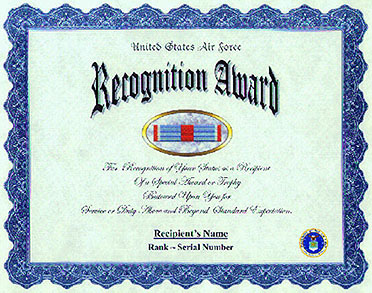 This ribbon is awarded to individual Air Force recipients of special trophies and awards as outlined in Air Force regula-tions. The Air Force Recognition Ribbon is worn after the Out-standing Airman of the Year Ribbon and before National Defense Service Medal. The Air Force Recognition Ribbon may not be worn on the Navy, Marine Corps or Coast Guard uniforms. Additional awards of the Air Force Recognition Ribbon are denoted by bronze oak leaf clusters (a silver oak leaf cluster denotes a sixth award).